The educational materials presented on this website have been developed in the context of two European research projects: HESPE and HELIO. More modules will follow with new research projects such as for example activities for using Science on a Table in schools. Researchers interested in cooperating with Science on a Table in the context of their project outreach may contact hanna.sathiapal (at) fhnw.ch. On 28 October 2003, the Earth experienced one of the most dramatic effects of solar eruptive events for many years. Following an intense flare, a halo coronal mass ejection was directed straight towards the Earth, with a velocity of 8 million km/hour. 19 hours after the explosion, strong geomagnetically induced currents caused blackouts of the power distribution grid; the accuracy of satellite navigation systems was degraded; airliners scheduled for trans-polar flights were rerouted to lower latitudes. This one event brought home the reality that modern technology-based societies are becoming increasingly vulnerable to this type of natural threat. And it clearly demonstrated that understanding the physics of these most powerful events is a necessary prerequisite to predict their occurrence and their potentially damaging effects in space and on the Earth. It has been recognized since the early days of the space program that high-energy observations play a crucial role in understanding the basic mechanisms of solar eruptions. Unfortunately, the peculiar nature of this radiation makes it so difficult to extract useful information from it that nonconventional observational techniques together with complex data analysis procedures must be adopted. The rationale of this project is to to mainstream the exploitation of high energy solar physics data in Europe by means of three complementary activites: theory, computation, and technology. The theory activity builds the background necessary to generalize the use of these data. The computation activity focuses on mathematical techniques to efficiently extract information out of the data. The technology activity builds upon these two work packages to generate science ready data products. These products will be easy to use by both the broader solar and heliospheric physics community, and the space weather community. HESPE will pave the way not only for the exploitation of the sheer amount of data already available today, but also for the future high energy solar space missions planned. This way, the project as a whole will guarantee a stable and long term positioning of Europe in the sustainable exploitation of such data products. HESPE was funded under the Space Programme within the EC’s Seventh Framework Programme (FP7; Grant No. 263086). Beneficiaries: Universita di Genova – UNIGE (Coordinator)*, Fachhochschule Nordwestschweiz (FHNW), University of Glasgow (UNIGLA), Universitaet Graz (UNIGRAZ), Centre Nationale de la Recherche Scientifique (CNRS), University of California at Berkeley (UCB), * NASA Goddard Space Flight Center is Third Party in UNIGE. Heliophysics is a relatively new domain that explores the Sun-Solar System Connection; it requires the joint exploitation of solar, heliospheric and planetary magnetospheric and ionospheric observations. 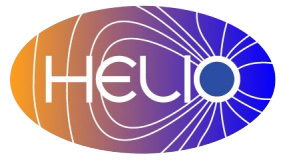 The Heliophysics Integrated Observatory, HELIO, has deployed a distributed network of services that address the needs of a broad community of researchers in heliophysics; it provides the most comprehensive integrated information system in this domain. HELIO provides access to data from more than 200 instruments from over 60 observatories and the tools to determine which are of interest. The Event Catalogue contains more than 60 event lists describing solar flares, CMEs, energetic particles and phenomena in the solar wind; the Feature Catalogue describes the evolution of solar and heliospheric features; the Instrument Capability and Location services provide information about which instruments are suitably located and a propagation model helps to tie the observations together; A very capable GUI is provided; a Workflow tool allows orchestration of the services. HELIO was funded under the Capacities Specific Programme within the EC’s Seventh Framework Programme (FP7; Grant No. 238969).